Watch High-Speed Ultrasonic XY Motor Align! Overmolding is a great injection molded process you can utilize in your part design to manufacture a multiple part assembly, color contrasts, add flexibility or eliminate secondary process assembly. Take advantage of this new feature from Xcentric Mold and Engineering by learning how to effectively design your part to be overmolded. Residents along Florida's Space Coast will soon hear a familiar sound: sonic booms. But instead of announcing a spacecraft's return from space, they may herald a new era in faster air travel. A customized moving magnet voice coil actuator from BEI Kimco is part of NASA's first asteroid sampling mission that could revolutionize our understanding of the early solar system. The special VCA was designed to meet the harsh requirements for a spectrometer moving-mirror application on the OSIRIS-REx spacecraft. Advanced plastics could usher in lighter, cheaper, more energy-efficient product components, including those used in vehicles, LEDs, and computers -- if only they were better at dissipating heat. It may be "full steam ahead" for the U.S. Navy's newest aircraft carrier, the USS Gerald R. Ford, but it won't be the catapult that will be steam powered. Less than one week after it was commissioned, the Ford launched and recovered its first fixed-wing aircraft in July using the Navy's new electromagnetic launch system (EMALS) and advanced arresting gear (AAG) system. 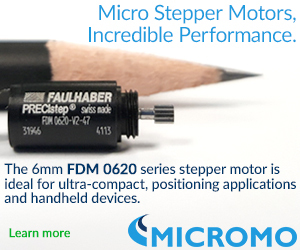 Servo motors and controllers need torque sensors to operate closed-loop feedback systems. 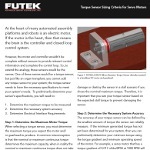 The engineers at FUTEK understand that choosing the right sensor for your system can be complicated, so they've compiled three easy steps in their latest white paper to help you narrow down your search. Read the technical article (PDF). Sometimes it's fun to think about how you'd solve a particularly offbeat challenge if given the chance. Case in point is document preservation. President Abraham Lincoln’s first handwritten draft of the Preliminary Emancipation Proclamation, a historic document in the collection of the New York State Library and New York State Education Department, will soon be encased in a new high-tech home -- this one custom designed and constructed by NIST. How would you handle the task? To support commercial vehicle manufacturers in meeting current and future emissions regulations, BorgWarner has developed an economical new series of multi-platform exhaust gas recirculation (EGR) coolers featuring a compact floating core. Unlike conventional solutions that must be specifically designed for each application, the company’s modular cooler family includes four highly adaptable standard designs for maximum flexibility covering a wide range of engine sizes from 2.0- to 16.0-liter displacement. The new EGR solution offers high robustness against thermal fatigue and enhanced coolant distribution for durable performance even with minimum coolant flow, while reducing NOX emissions. 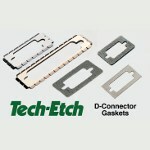 Tech-Etch offers EMI shielding D-Connector gaskets in a wide variety of materials. Five standard sizes of 9-, 15-, 25-, 37-, and 50-pin configurations are available in Stainless Steel; Beryllium Copper; X-, Y-, Z-axis Conductive Foam; and Metalized Fabric consisting of a metalized fabric over a polyurethane foam core. 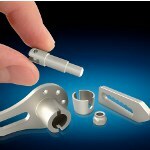 Additionally, four conductive elastomers fill out the D-Connector product line: Series 1000 Supershield silicone elastomer filled with conductive metal particles; Series 4000 Multishield composite material environmental seal; Series 5000 Monoshield for applications where the gasket is limited to 0.02-in. thickness and gap irregularities do not exceed 0.003 in. 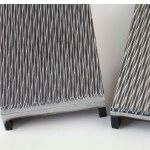 ; and Series 5500 Weaveshield composite (woven aluminum wire screen impregnated with either a neoprene or silicone elastomer), and EMI shielding and pressure seal gasket material used for very small gaps. Custom gaskets can be manufactured. The new SDLM-019-070-01-01 direct drive linear motor is the latest addition to the series of zero-backlash, zero-cogging, high-acceleration, high-speed, high-resolution, long-life linear servo motors from Moticont. 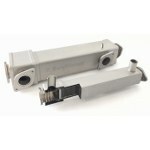 Also known as an electric cylinder, this compact direct drive linear motor is just 0.75 in. (19.1 mm) in diameter and 2.75 in (69.9 mm) long. Protected inside the motor housing, the linear optical quadrature encoder is directly connected to the shaft for the greatest possible accuracy. This unit has a stroke length of 0.500 in. (12.7 mm), a continuous force rating of 9.7 oz. (2.7 N), and peak force of 30.7 oz (8.5 N). Click here for more information on this product series. NanoSteel, a leader in nanostructured steel materials, has launched its first product for the laser powder bed fusion additive manufacturing process. BLDRmetal L-40 is a case-hardening steel powder that provides high hardness and ductility (case hardness >70HRC, 10%+ core elongation) and prints easily on standard commercial equipment. This alloy provides superior performance to M300 maraging steel and is an alternative to difficult-to-print tool steels such as H13. Expanding the potential use of 3D printing in a wide variety of hard materials markets, BLDRmetal L-40 is designed to be used for parts including tools, dies, bearings and gears. 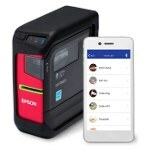 Epson LABELWORKS PX introduces the LW-PX400, a portable industrial label and wire-marking printer for creating professional labels and markers wirelessly or via USB. This unit is the smallest, lightest, and most flexible printer on the market and can work wirelessly in the field (iOS and Android mobile devices, PCs, and Macs). The Datacom app is designed to streamline labeling jobs common in the telecom and datacom industries. Pre-loaded TIA-606-B patch-panel templates from selected hardware manufacturers make it easy to fit data into different-sized panels. The iLabel app includes industrial graphics, photo import, pre-formatted templates, speech-to-text recognition, date-time stamp, and works with Google Drive and Dropbox cloud storage. Lifetime warranty. Smith Metals Products has added Titanium Metal Injection Molding (TiMIM) capabilities to its MIM portfolio of materials that include stainless steels, alloys, and ceramics. TiMIM involves mixing powdered Titanium metal with a binder material to compose a feedstock capable of being handled by injection molding equipment. Metal injection molding allows complex Titanium parts to be shaped with precision in a single operation and in high volume as compared to traditional Titanium machined metal components. Adding TiMIM capabilities opens a new, wider range of component applications for Smith Metal Products, where strength-to-weight ratio parts are desired. It is often accomplished with superior features using Titanium compared to other strong (but much heavier) metals like steels. Soldiers have many reasons to be excited about the new Sig Sauer modular handguns, which the Army will begin fielding in November. Testing of the modular handgun system, or MHS, this spring by Soldiers at Aberdeen Proving Ground resulted in overwhelmingly positive feedback. Researchers at the University of Central Florida have developed a new color-changing surface tunable through electrical voltage -- a breakthrough that could lead to three times the resolution for televisions, smartphones, and other devices. Magnets play a vital role in everyday life, are used in everything from hard drives to energy production, and scientists have already been able to study the structure of thin films of magnetic materials. However, imaging the inner structure of thicker forms of magnets has remained an experimental challenge until now. This miniature XY linear stage with piezo-ceramic motors combines sub-micron precision with excellent dynamics -- ideal for optics, medical design and photonics applications. In addition to the high speed up to 200 mm/sec, the low inertia (direct drive, no rotating parts) allows for a rapid start-stop behavior with settling times in the milliseconds. How can you use this XY stage? 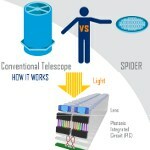 Telescopes could dramatically shrink by up to 90% in size and weight in the future with a next-gen Lockheed Martin technology called SPIDER. A thin, scalable array of tiny lenslets piece together visual information like a jigsaw puzzle (a science called interferometry) and will eliminate all the bulk of traditional telescopes. Lighter instruments that are faster to build mean cheaper launches, multi-mission spacecraft, and even benefits down here on Earth. Read more about this incredible innovation.